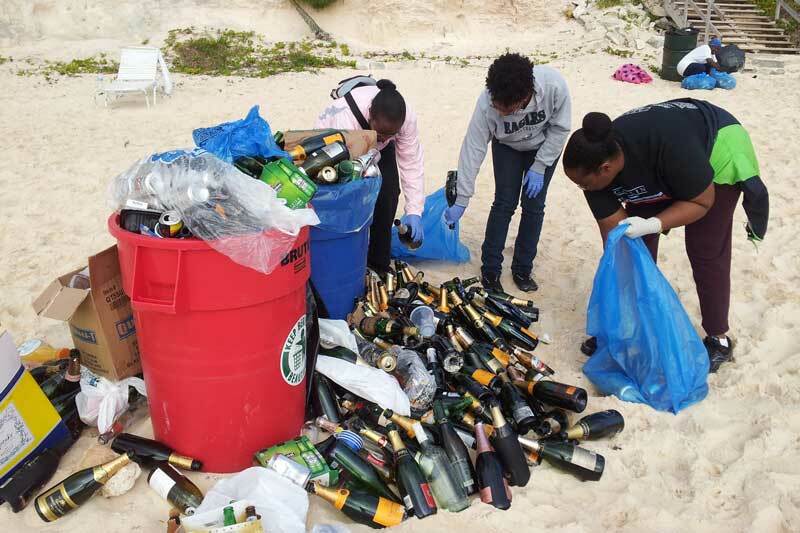 Elbow Beach plays host to a popular get-together every Christmas Day, and Keep Bermuda Beautiful [KBB] are reminding attendees to help keep the beach beautiful. KBB Executive Director, Anne Hyde, said, “KBB assists the Department of Parks by ensuring that extra bins, on loan from Waste Management, are placed along the beach. On Boxing Day morning KBB volunteers help haul the trash off the beach and give the area a thorough cleanup. “This year we are reminding attendees to use the waste bins, or even better, bring their trash off the beach and dispose of at home. There are no event organizers or cleaners, but with everyone’s help, this can become a ‘No Trace’ event. You can view our past coverage of the Christmas day event at Elbow Beach here. Each group bring a blue bag + a black bag. Fill carefully. leave at the trash cans when you go. Put one or two in your “Beach” bag now, you may forget on Xmas morning! There are never enough trash cans. Great suggestion, @Loquat Tree. KBB will be putting out twice as many blue bins for bottles and cans, but the additional concept is to help REMOVE the trash from the beach. Pack in and pack out. Thanks! Drinking in public, illegal, if you’re poor and destitute. But fine down at the beach during Cup Match, right? There is a bar under a tent at the beach entrance all summer. The LAW IS THE LAW! The law is the law when it applies to others, right? Why doesn’t this event move to Horseshoe where there is more parking, proper toilet facilities and it is easier for Parks Dept. to remove the trash that is not otherwise carried home by the participants (or disposed of in a dumpster or two, which Horseshoe’s parking lot is big enough to also accommodate)? The event should move to the airport dump. There’s lots of parking, and they can drop their trash right where they are standing. Makes a lot of sense, right. I guarantee you it will remain @ Elbow, And people with still b**** about getting parking tickets. Cause the police make a lot of money off this event. They get to issue lots of parking tickets. A lot of wine bottles hummmmm……. Does Elbow have a couple of dumpsters? One for regular trash. The other for bottles & cans. How about you take with you what you bring. You all make the effort to bring the supplies, why can’t you take the empties home with you? I run that beach on a regular basis, and the trash after these events is really bad….just be considerate. The beach is a beautiful place, why can’t you leave it like you find it? As of the time reading and responding to you 1 in every 5 people is a self absorbed c*** that doesn’t feel they should. It would be nice if people did that when they go camping over Cup Match as well. The trash they leave is disgusting. The 2 pictures say it all. 2nd pic, look who comes to clean up the mess..